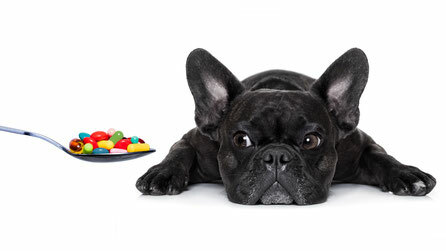 Pets on longterm medications must legally be checked regularly by a vet to ensure that the medication and dose are still effective and that no side effects are developing. Our practice policy is that these rechecks are carried out every 3-4 months. There is a reduced consultation charge for these visits. Repeat prescriptions are issued for between 1 and 3 month's supply depending on the medication, how long the pet has been on it and how stable the animal's condition is. Please give at least 24 hours notice for repeat prescription requests as these must be approved and checked by a vet. Please use our order form below for non-urgent repeat prescriptions where your pet is not due a recheck. For any more urgent requests, please phone us. On request we can supply written prescriptions where an owner would like to purchase the medication elsewhere. There is a charge of £15.21 incl VAT per prescription. Each prescription covers one month's supply of one medication repeatable up to a maximum of three times (in line with our 3-4 month recheck policy above). We require two working day's notice for a written prescription request. Please note if purchasing medication online we strongly advise ensuring that the supplier is reputable and selling genuine medications. Please allow plenty of time to complete the order and delivery process from the supplier (often at least a week).